ThinkMate. 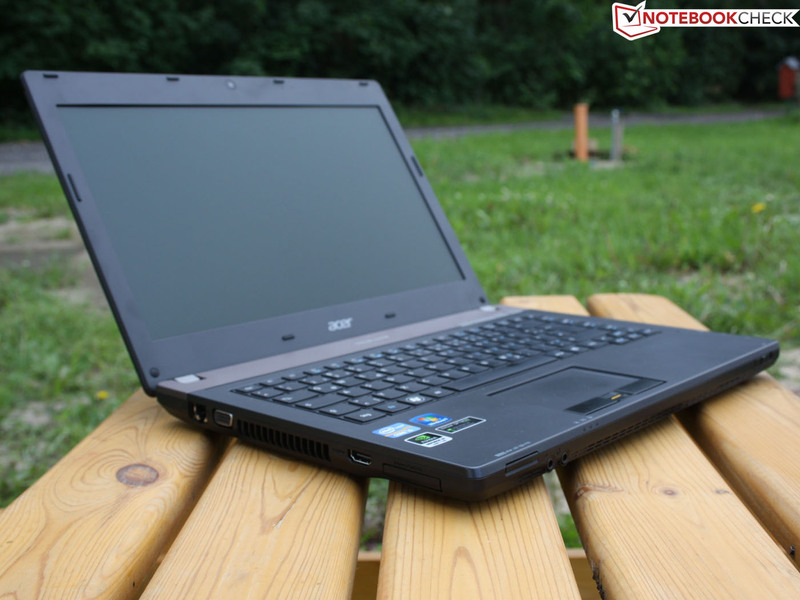 The Acer TravelMate P643 features a docking port, multi-bay drive, input devices with solid feedback, and sturdy magnesium hinges. Can this 14-inch TravelMate compete with Lenovo ThinkPads? 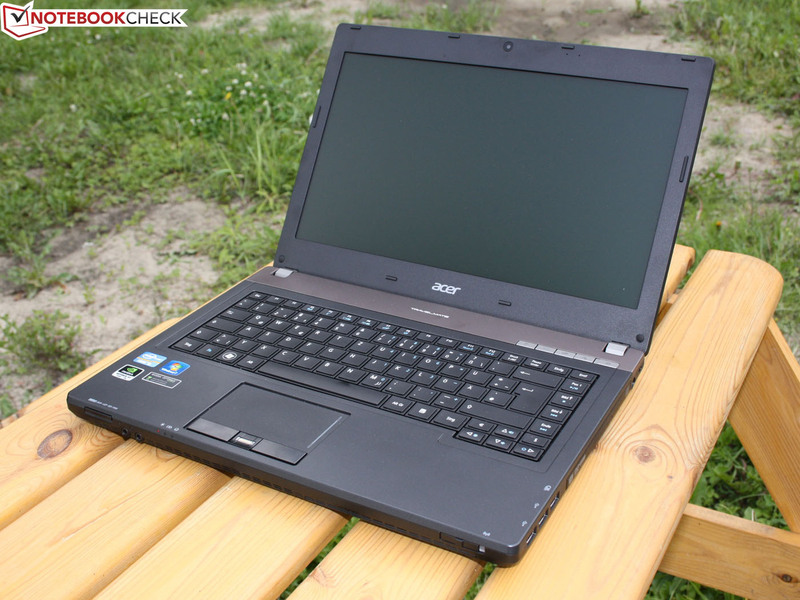 Acer TravelMate P643-MG-53214G75Mikk features the GeForce GT 640M. Multimedia machine or business laptop? 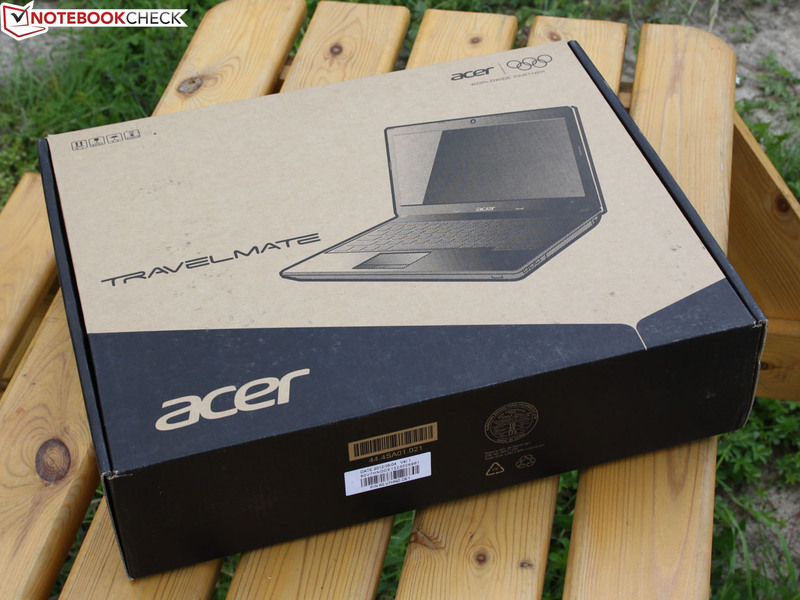 Historically, Acer has added consumer features to its business-oriented TravelMate series. For example, the 2010 TravelMate 7740G featured the Radeon HD 5650M graphics card. While gamers were pleased with the non-glare display and gaming performance of the 7740G, business users were displeased with the limited availability of ports, an imprecise keyboard, a less-than-sturdy display lid, and a mediocre battery life. 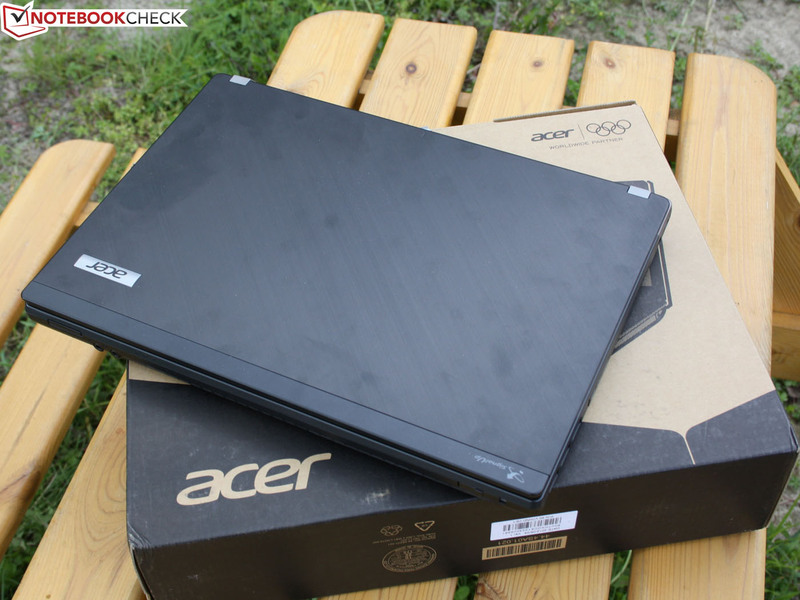 In September 2011, the Acer TravelMate TimelineX 8473TG returned the series to a more traditional business style, using a nondescript case, matte surfaces, and crisp input devices with good feedback. To appeal to home users, a mid-level GeForce GT 540M was included in the package. In this review, we consider the 14-inch TravelMate P643-MG-53214G75Mikk, the successor to the 8473TG. While Acer has removed the “TimelineX” branding from the series, the case is essentially unchanged. This is not necessarily a bad thing as we praised the predecessor for its quality construction. Will this TravelMate have the necessary traits of a business workhorse machine? Did Acer provide everything a business user might want in the categories of ports, display, hardware components, and input devices? Does the notebook come with business-specific software pre-installed? This review seeks to answer all of these questions and more. Fingerprints are hard to remove from the brushed aluminum. Created for office use, the case is sturdy, heavy, and lacking frills. The TravelMate P643 is wrapped in a case that is unlikely to win any prizes for attractiveness. The case’s design is hardly delicate and the 2.4 kilogram (5.3 pound) weight underlines the case’s overall heft. This is also visually apparent in the notebook’s 31 millimeter (1.22 inch) thickness. By comparison, the 14-inch ThinkPad T420, which is also considered bulky, only weighs 2.0 kilograms (4.4 pounds) and the Toshiba Tecra R840-11E is also in the 2 kilogram (4.4 pound) range. Nonetheless, business users are unlikely to be too concerned with the extra weight. The TravelMate’s higher weight is the direct result of the materials used in the construction of the notebook. The case is predominately a magnesium-aluminum alloy with the area around the keyboard and the display lid constructed from brushed aluminum. The unobtrusive and sophisticated appearance, however, is marred by the constant appearance of fingerprints which are difficult to remove, especially on the display lid. The display bezel uses a black matte plastic that conveys a sense of serious business. Fingerprints and scratches do not show on the bezel or the underside which is made from the same material. This matte surface appears to be tough and resilient. The high torsional rigidity of the case and display lid and the quality of the hinges also uphold this impression of toughness. 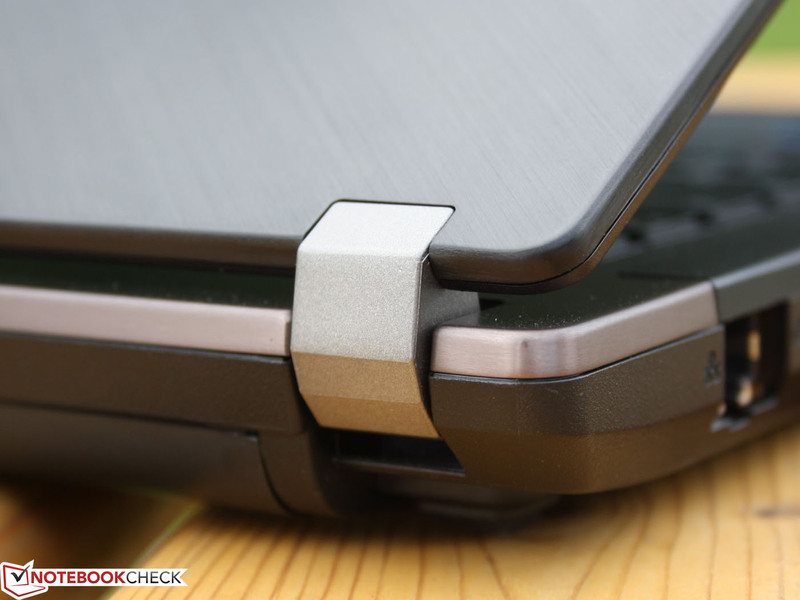 While we would not have thought it possible, the TravelMate uses massive silver-colored magnesium hinges. These hinges hold the display in place firmly in any position and without any rocking. When the display lid is opened to its maximum angle, there is a very firmly felt stop. In the preceding TravelMate TimelineX 8473TG, the area around the optical drive was found to be the weakest point of stability. 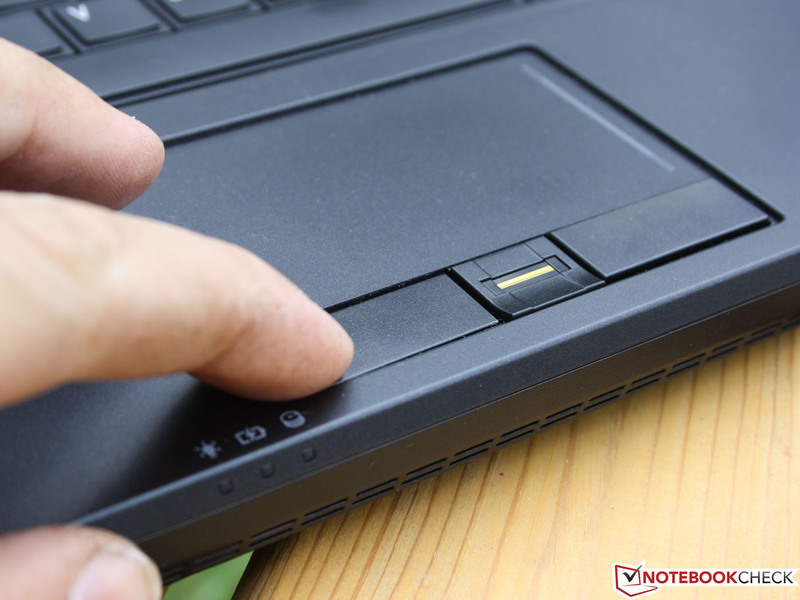 This has been resolved in the TravelMate P643 and pressure applied to the keyboard near the Enter key or on the underside no longer causes deformation. The display lid is fairly thin but still quite rigid due to its aluminum construction which also allows it to resist selective pressure. 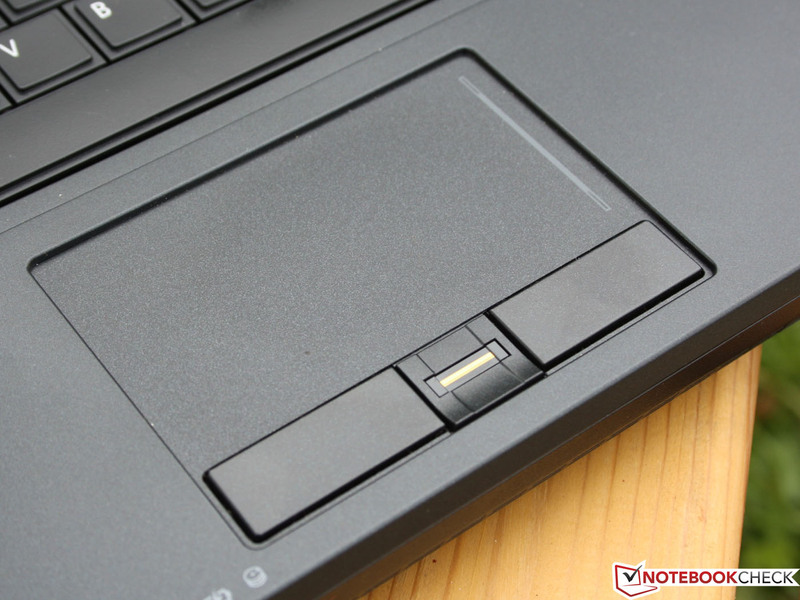 Fewer and fewer notebooks use display latches and the TravelMate P643 is no exception. Only a handful of pro-business laptops, such as the T Series, HP Elitebook, and Dell Latitude, still use this. A large cover is secured to the underside of the notebook by five screws. Removing this cover provides access to the hard drive mounted in a rubber bracket, two DDR3 memory slots with one already occupied, and an unused mini PCIe slot. 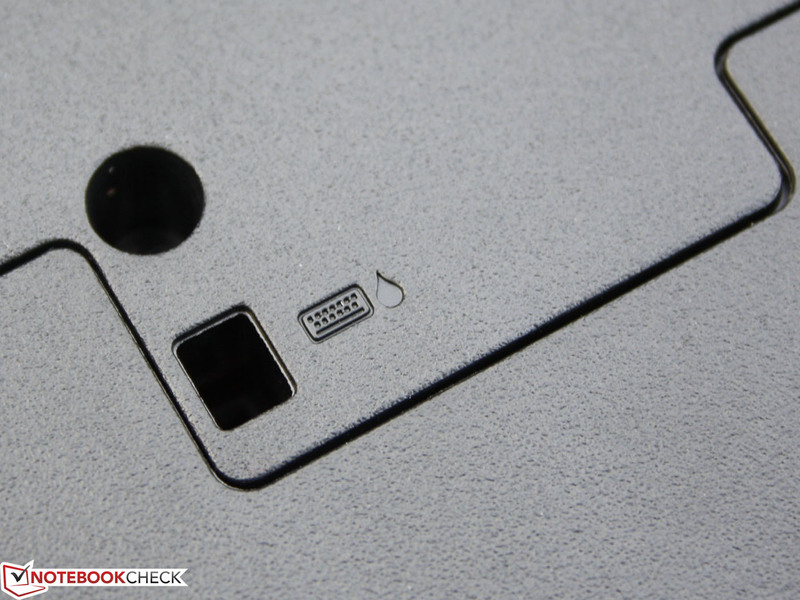 While this slot could be used for a 3G module, the notebook lacks the requisite SIM card slot and integrated antennae. A second, smaller cover allows access to the Wi-Fi module and its two antennas which terminate above the display. This antenna arrangement is marketed as Acer SignalUp. 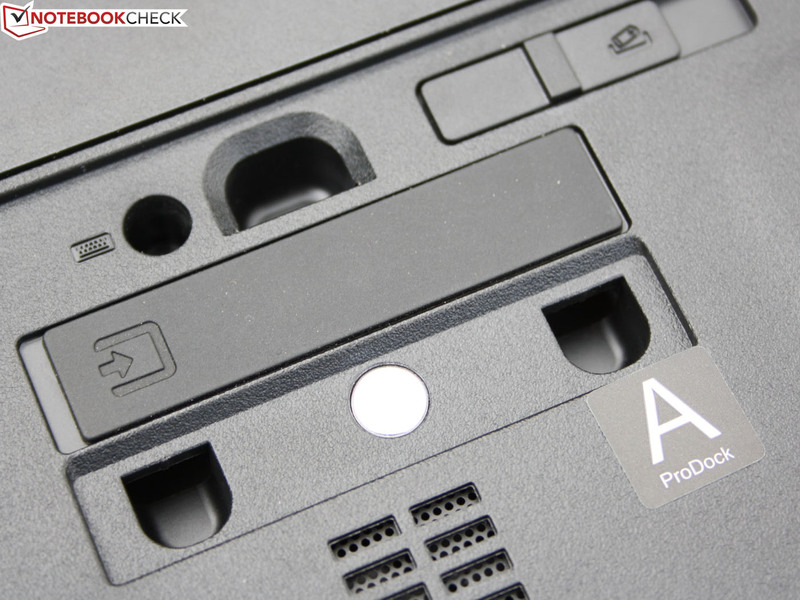 The TravelMate P643 distinguishes itself with a docking port for the Acer ProDock and the multi-bay DVD drive. A rail mechanism allows the drive to be removed while the laptop is in use. We also identified water channels for the keyboard on the underside of the notebook. 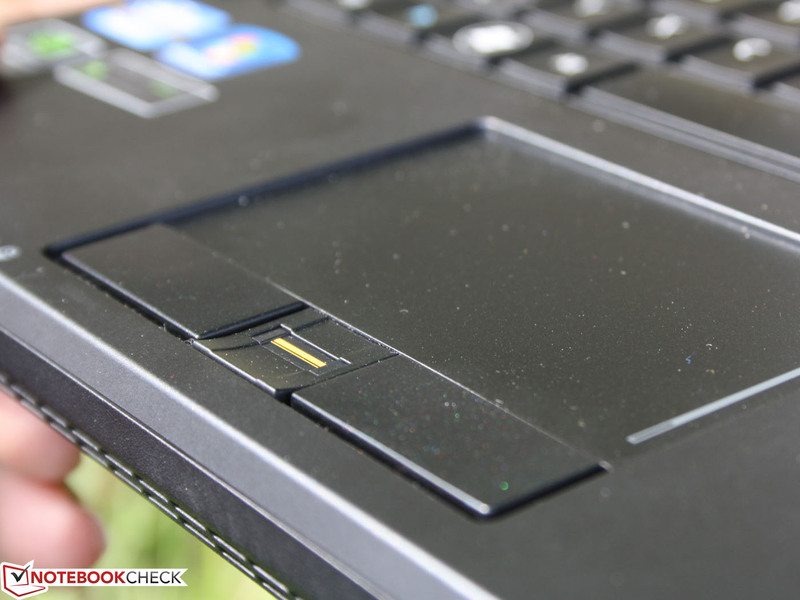 Accidental spills on the keyboard are drained through these channels to prevent damage to the electronics. 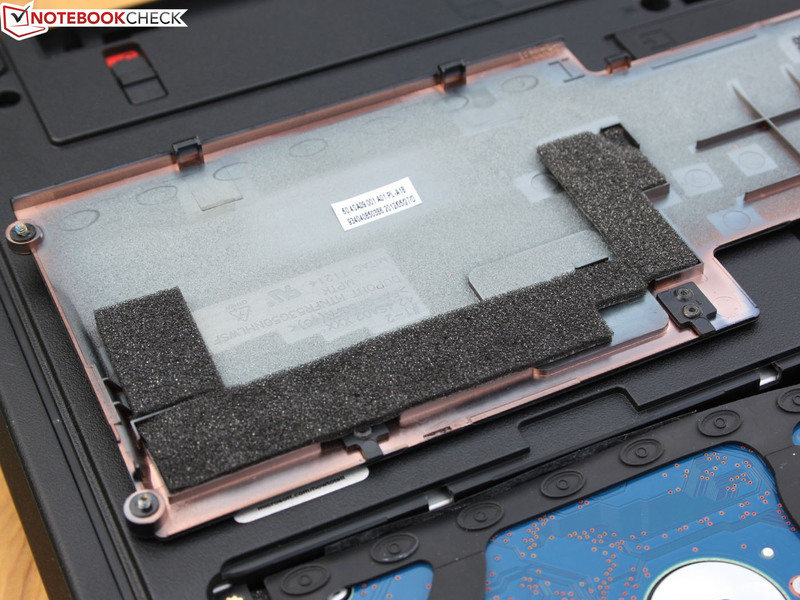 We also found something we have never found in an Acer notebook – an opening used for cleaning the fan. Compressed air applied to this opening cleans dust from the heat sink at the end of the heat pipe. The TravelMate P643 features a new selection of ports compared to the preceding TravelMate TimelineX 8473TG, a change largely for the better. Instead of one USB 3.0 port, there are now three. The formerly used eSATA port is now missing but an ExpressCard/34 is included instead. 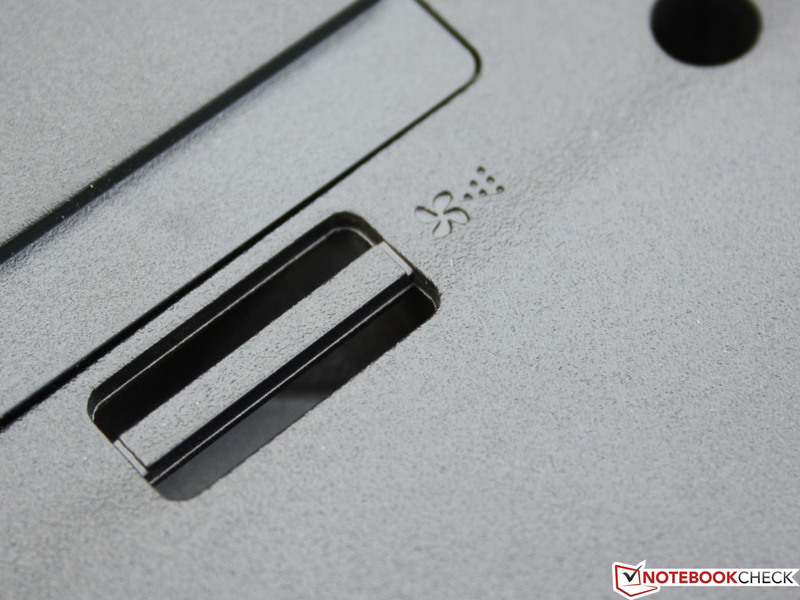 This format of card slot is typical for business and professional laptops so users can continue to use any cards they already own. At present, this card specification can be used for FireWire, serial ports, and eSATA. TV tuner cards, which have fallen out of favor, are also available. We found the placement of the ports on the sides to be somewhat unfortunate. 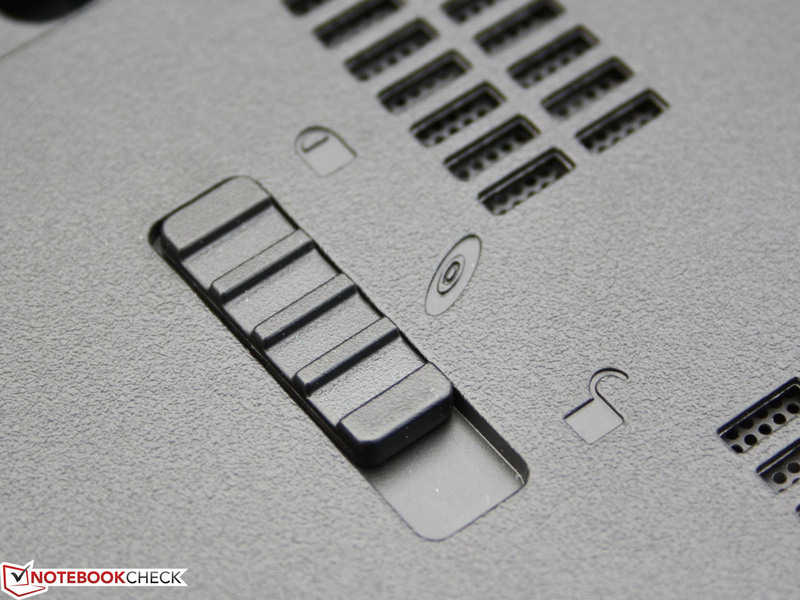 As the HDMI port is on the front left and the USB ports are located on the front right, the use of any peripherals is likely to cause cables to crowd the work surface unless the aforementioned docking station is used. The elevated card reader and Wi-Fi switch on the front are, however, handy. We found the TravelMate’s communication interfaces up-to-date, with the exception of the lack of a 3G-UMTS (Universal Mobile Telecommunications System) module. Gigabit Ethernet is provided by a Broadcom NetXtreme controller, and Wi-Fi 802.11b/g/n and Bluetooth 4.0 are provided by the Intel Centrino Advanced-N 6235 mini PCIe card. This Centrino card, in combination with the Intel processor, also allows the use of Intel Wireless Display (WiDi) technology. An external Wi-Fi adapter, such as the Netgear Push2TV Adapter, is required to transmit a signal from the notebook to any type of monitor. 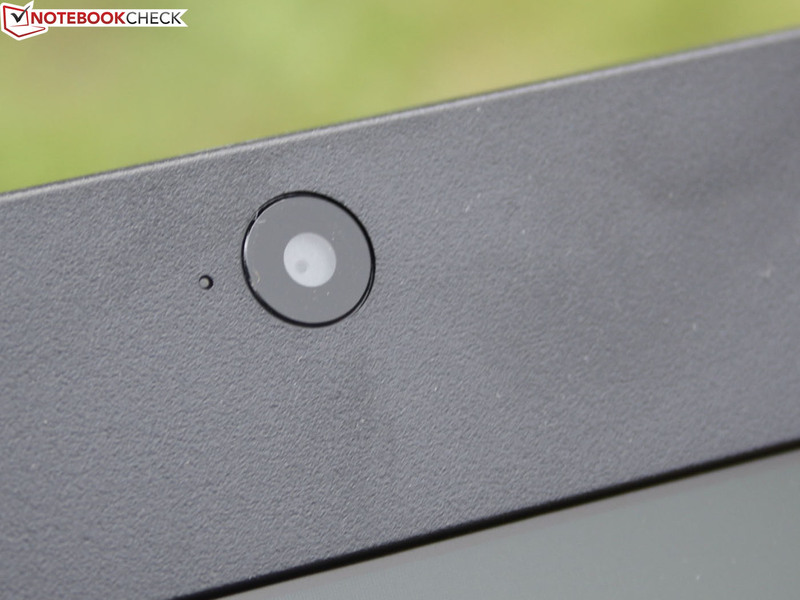 The built-in webcam has a maximum 1280x720 1.3 megapixel resolution. In low light testing, picture colors remained accurate but graininess increased. While the compact case lacks a SmartCard slot, the combination of Kensington lock slot, fingerprint scanner between the mouse buttons, and Trusted Platform Module (TPM) provides a basis for security. 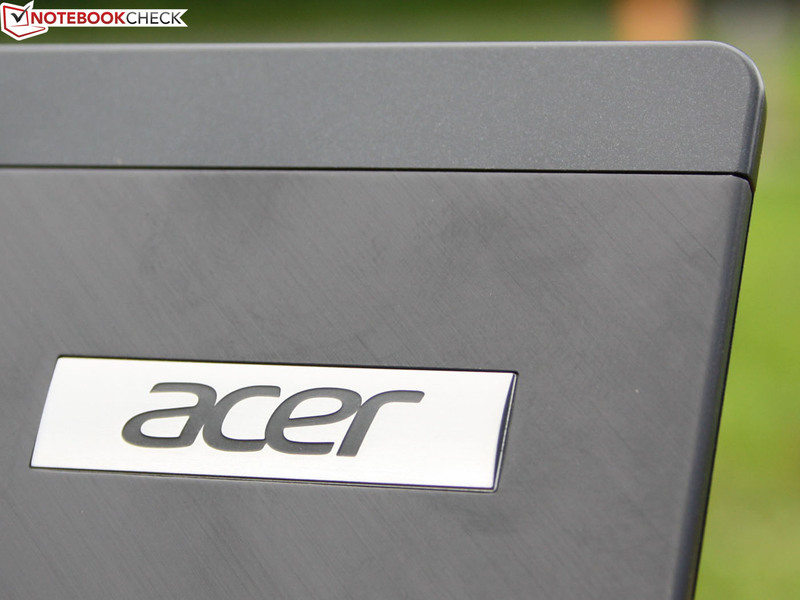 Acer does not stop at the hardware level and also includes Intel’s Smart Business Advantage. This security bundle gives the user a number of features (TPM, USB port blocking, password protection, and fingerprint recognition), hardware administration (updates, PC health center), software access levels, and power settings. 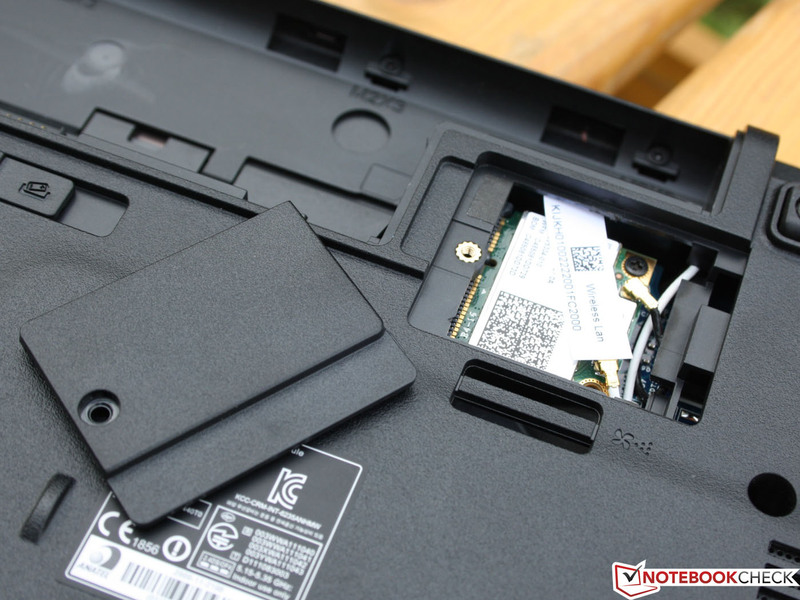 The hard drive is not only protected by the small rubber frame but also by the Acer MotionProtect tool. The retail package only includes a six-cell battery, the 90-Watt power adapter and cord, and a few manuals. However, many optional accessories and peripherals are available separately. The Acer ProDock is available for 160 Euro (~ $199) and provides VGA, DVI, and 6 USB ports. This dock fits both the newer Ivy Bridge TravelMate P643 as well as the older TimelineX series. While the multi-bay appears ready to accept a secondary battery or hard drive, unfortunately neither option is available. 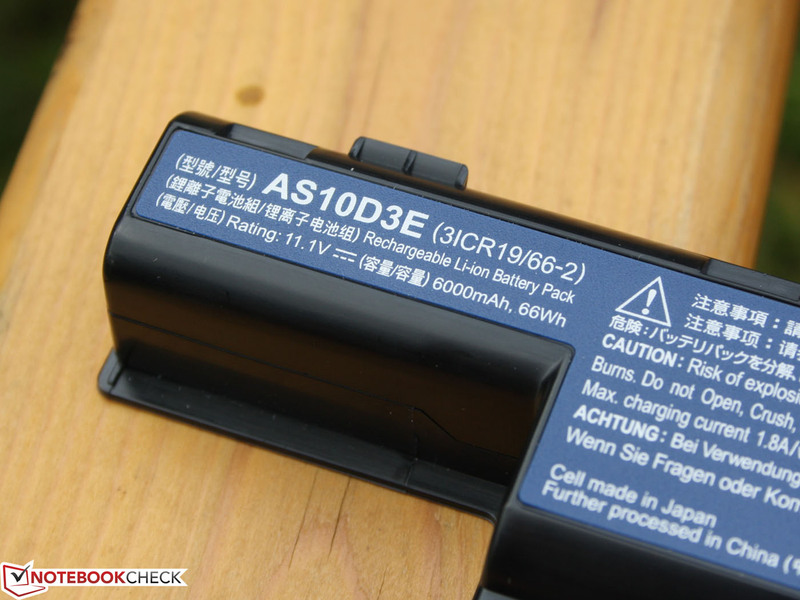 Secondary batteries are only available for the very old TravelMate C200/C300 and 8200 series. The TravelMate P643 includes a standard 24-month warranty with 12 months of International Travellers Warranty (ITW). Extended warranties start at 70 Euro (~ $85) and provide additional security. 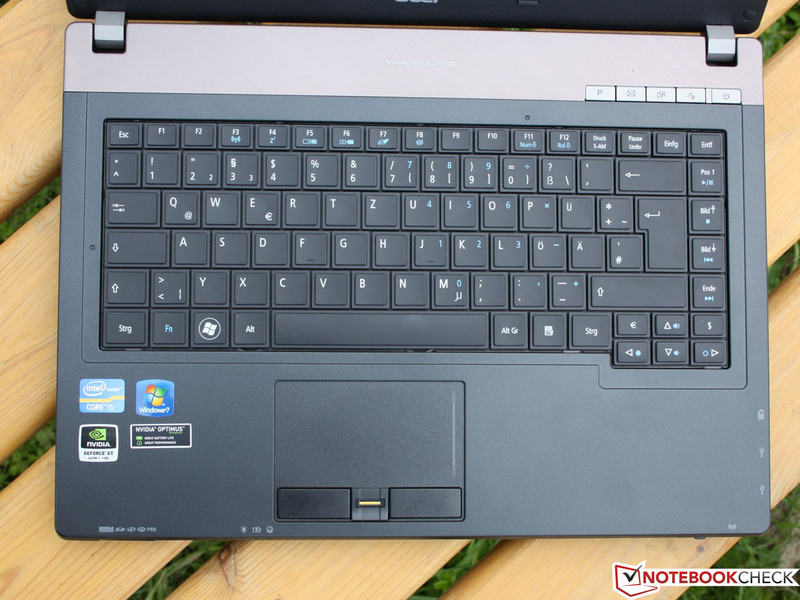 For the TravelMate P643, Acer continues to use the floating keyboard of the predecessor. The spaces between the keys are very small and the keyboard provides a very homogenous impression and the feedback also manages to impress. Key travel is ample, impact is firm, and the keyboard does not flex anywhere. 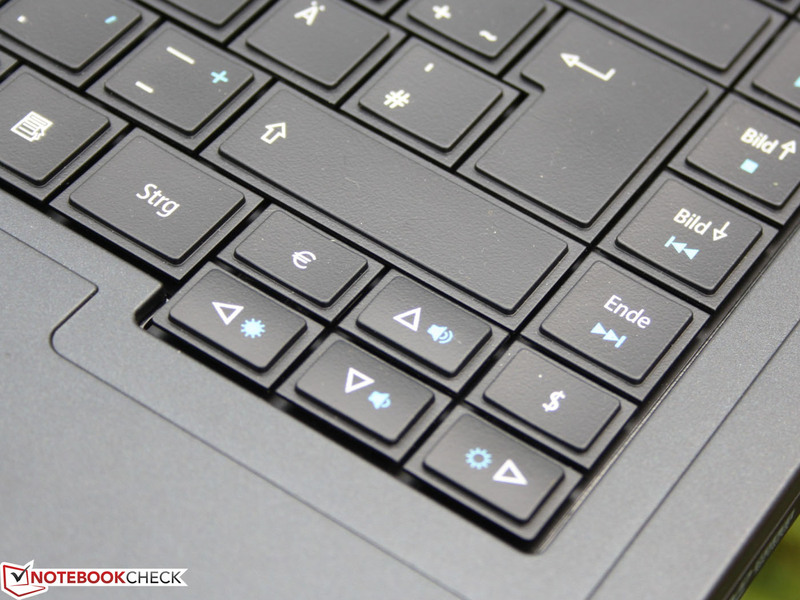 Typing accuracy is improved due to the keys’ slightly concave shape with a dip in the middle of each key. 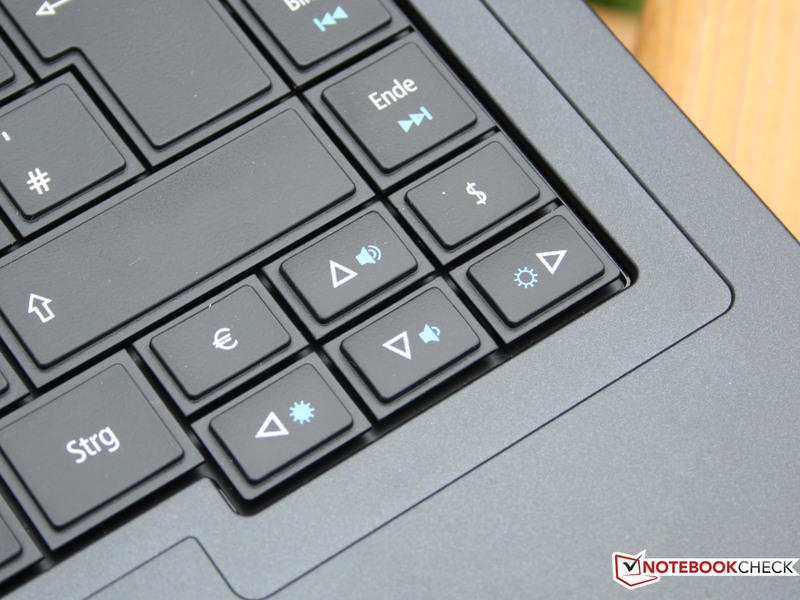 This is a feature typically found on desktop keyboards and we did not like this aspect as fingers tend to catch on the hard edges of the keys. Even though this hampers feedback, it has no negative impact on typing speed. The keyboard layout also poses no problems. None of the keys are undersized and the Enter, Shift, and Ctrl keys all have good sizes. The arrow keys are separated from the other keys. The Ctrl and Del keys are in the corners, allowing users new to the TravelMate series to become quickly acclimated. A keyboard backlight is not available. 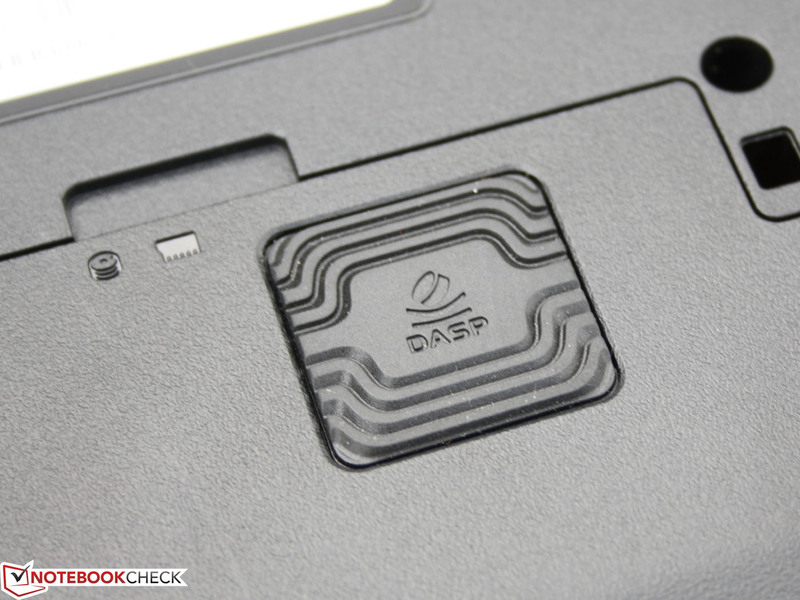 The Synaptics V7.5 touchpad serves as the pointing device for the TravelMate P643 and is recessed fairly deeply into the wrist rest. While this can be distracting at times, the slightly rough surface allows for precise cursor control. 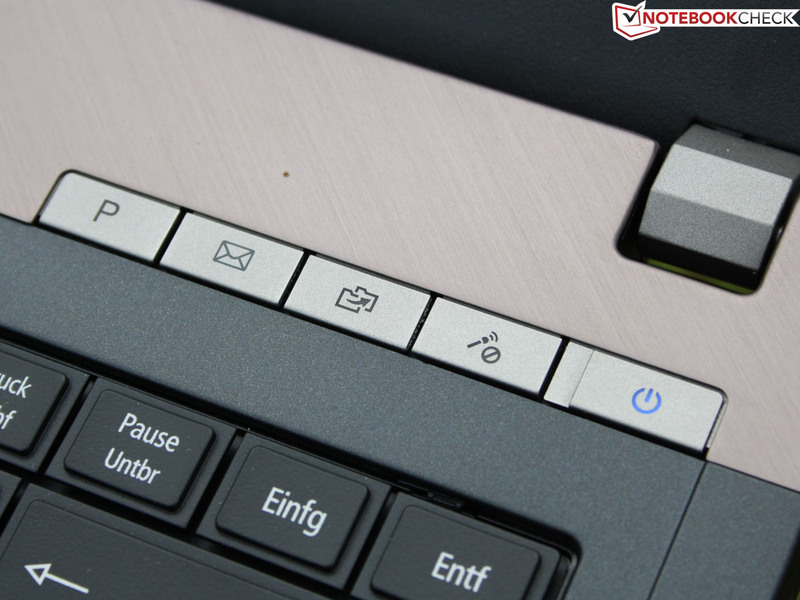 The touchpad supports multi-touch gestures and has an unmarked vertical scrollbar. The mouse buttons offer clear tactile feedback and their long travel allows for quick and easy control. The buttons are made out of smooth plastic but they tend to give a bit under selective pressure, providing an almost rubberized feel. Overall, we found the touchpad to be pleasant to use. Recessed touchpad. Mouse buttons have long travel. The TravelMate P643’s matte 14-inch display has a native 1366x768 resolution in the 16:9 aspect ratio. This resolution is the only available choice for both the 14-inch and 15.6-inch TravelMate models. Considering how many screen options are available for the HP ProBook and the Lenovo ThinkPad, this certainly leaves a lot to be desired. Demanding users may wish to consider the Lenovo ThinkPad T420 or HP ProBook 6460b, both of which offer a better 1600x900 (HD+) resolution. 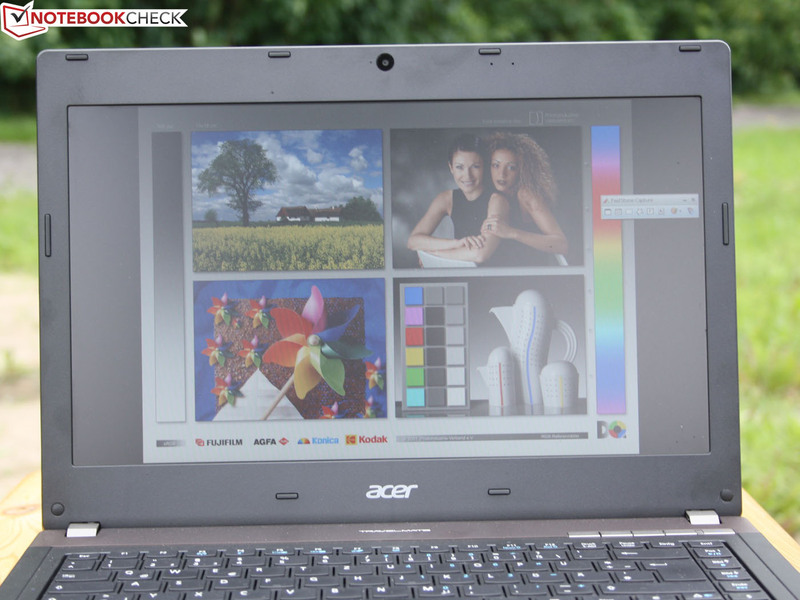 We used the Gossen Mavo-Monitor to test the LED-backlit TN display and observed a maximum brightness of only 195 cd/m2, a level on par with economical consumer notebooks. The measured 87 percent brightness distribution is good enough to avoid bright and dark spots. On a completely white screen, this uneven distribution becomes noticeable. Deep blacks and vivid colors are not strengths of the TravelMate. We measured an extremely low contrast ratio of 138:1 which causes pale, washed out colors. A higher contrast would certainly improve the device’s outdoor usefulness. Subjectively, photos and movies did not appear very good and anyone who has used a better display would immediately notice the difference. For graphics professionals, color space is a critical aspect of TFT displays and often determines which notebook is purchased. 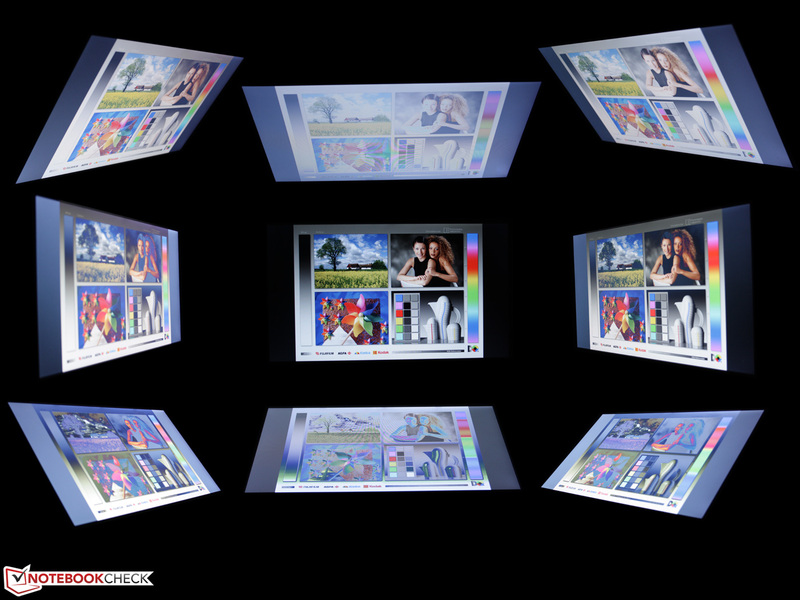 A good display should be able to accurately reproduce as many colors of the spectrum as possible. The most common reference color spaces are the sRGB and AdobeRGB. In our testing, we observed that the TravelMate P643 could not reproduce either of these color spaces with its run-of-the-mill display (see pictures 1 and 2). The preceding TravelMate TimelineX 8473T did not fare any better as it used the same display (picture 3). By comparison, the second row of pictures shows how a proper color space should look. 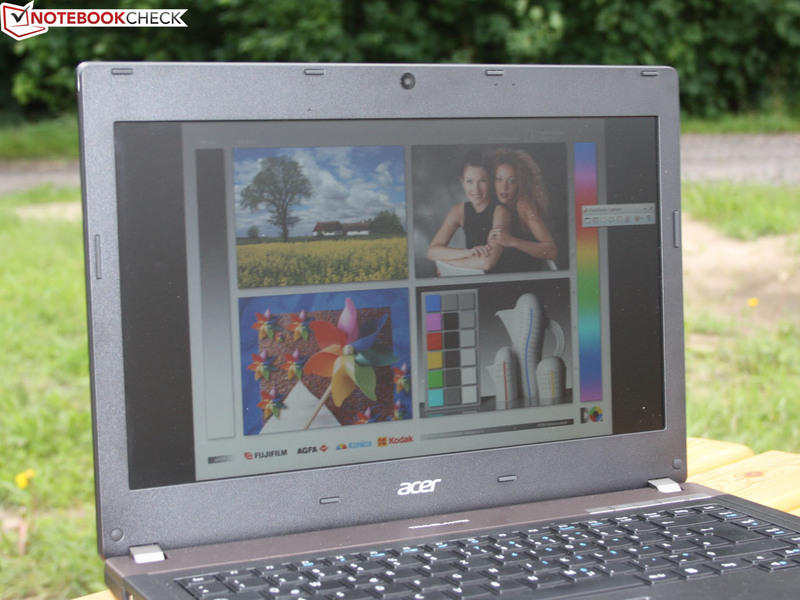 In outdoor use, we found the 14-inch notebook to be uninspiring. In overcast conditions, the brightness was sufficient as long as the user was directly in front of the display. Despite the matte display surface which limits reflections in the work environment, the aforementioned brightness level is unsuitable for bright surroundings. The TravelMate P643 does not come with an ambient light sensor to automatically adjust screen brightness. In terms of viewing angle stability, we observed color distortion and inversion at fairly small vertical deviations from the head-on viewing angle and slightly larger horizontal deviations. Overall, viewing angles were quite limited. Looking at photos and watching movies would be no fun for anyone outside the rather limited “sweet spot”. Ghosting and blurry contours result from being outside the intended viewing arc. It should be noted that notebooks in this price range typically do not have decent viewing angles. More expensive notebooks such as the MacBook Air from mid-2012, ThinkPad T530, and Asus Zenbook Prime UX31A ultrabook prove how much better an IPS or a very good TN panel can be. Two configurations of the TravelMate P643 are available. Our test sample uses the Core i5-3210M 2.50 GHz dual-core processor. The other possible configuration uses the less powerful Core i3-2370M 2.40 GHz dual-core processor which does not support Turbo Boost 2.0. Whether or not the TravelMate P643 can fully exploit its processor turbo mode is something we determined in the course of our testing. Using Turbo Boost 2.0, the Ivy Bridge Core i5-3210M could theoretically overclock itself to 3.1 GHz in single-core operation. Of course, this overclocking is only possible if the notebook has an efficient cooling system to handle the additional heat generated during overclocking. Our TravelMate should have enough space within the case for such a cooling system, but thinner notebooks often lack the required space. 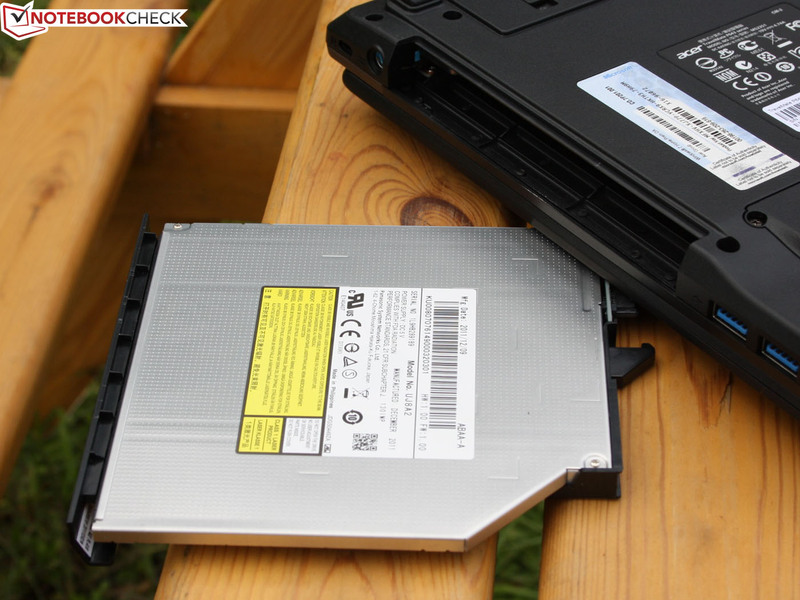 The hard drive in our TravelMate is the 750 GB 5400 RPM Hitachi Travelstar 5K750 (model HTS547575A9E384). This particular drive is one of the slower ones we have tested and will be discussed in detail further in this section. 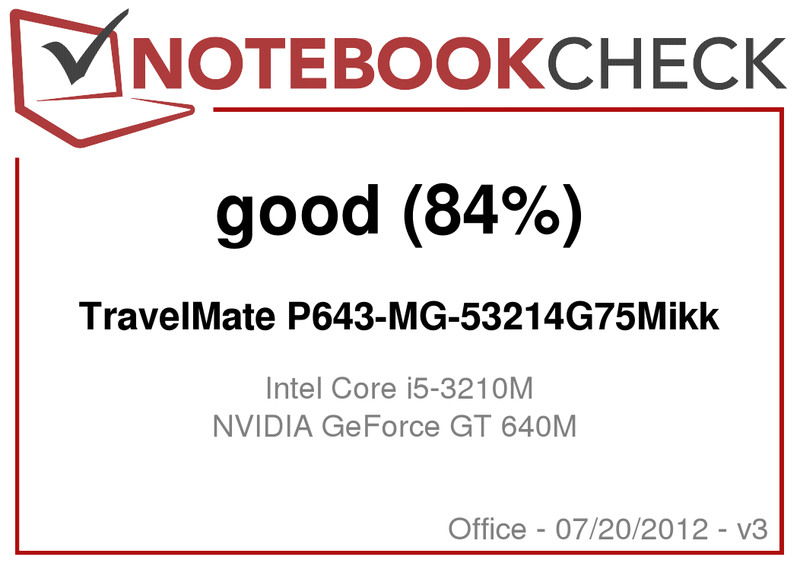 The TravelMate P643 uses the Nvidia GeForce GT 640M. This card features 1024 MB DDR3 VRAM and replaces the GeForce GT 540M installed in the predecessor. The GT 640M is a middle-class GPU suitable for high-resolution gaming and is capable of relieving the CPU in applications that make use of CUDA computing. 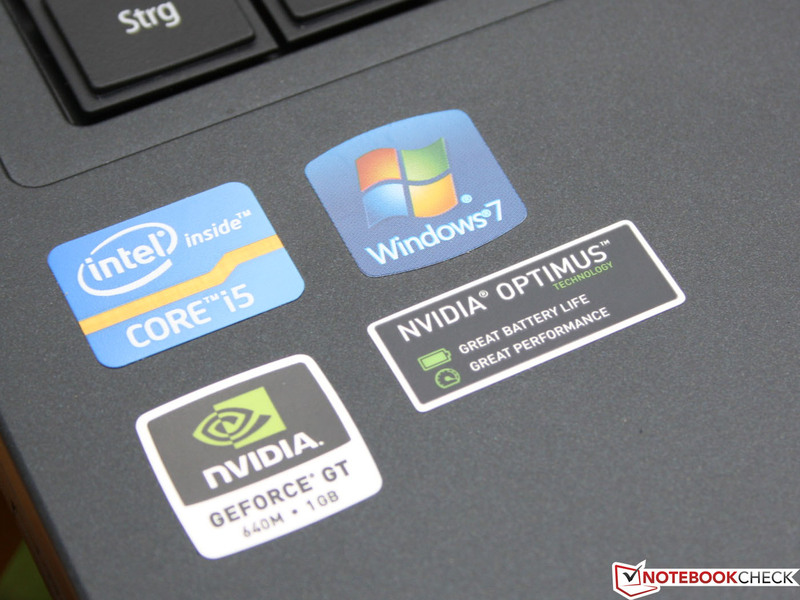 In addition, this GPU makes use of Nvidia Optimus technology which allows the notebook to switch between the discrete GeForce card and the processor-integrated Intel HD Graphics 4000. While the HD Graphics 4000 is always active, the GeForce card is only used if higher graphical performance is required. During our testing, we focused on comparing the TravelMate P643’s Core i5-3210M, which operates between the 2.5 GHz base clock and 3.1 GHz Turbo Boosted clock, with the preceding TravelMate TimelineX 8473TG’s Core i5-2410M, which has a 2.3 GHz base clock and a 3.1 GHz Turbo Boosted clock. As we do not have any data on the less expensive Sandy Bridge Core i3-2370M processor, we are unable to provide performance comparisons between the two TravelMate P643 configurations. In our testing, the Ivy Bridge processor of the TravelMate P643 scored 2.84 points in the Cinebench R11.5 multi-core test. The Core i5-2410M scored 2.60, approximately 8 percent slower, in the same test. By comparison, the Core i5-3210M performed at a comparable level to the first-generation quad-core Core i7-720QM. The 14-inch Gigabyte U2442N and 15.6-inch Samsung 550P5C-T02DE are both equipped with the same processor and scored marginally higher with performance gains of approximately 2 percent. Nonetheless, the cooling system in our test unit definitely worked well and we did not observe any thermal throttling as we measured a constant 2.9 GHz operation during the multi-core test. The TravelMate P643 scored 5231 points in the Cinebench R10 64-bit Rendering single-core test. 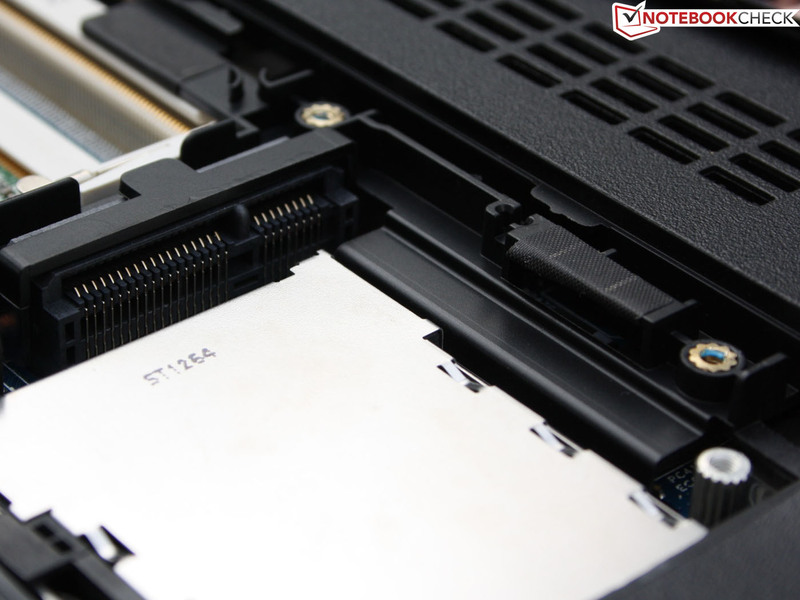 Compared to other notebooks featuring the Core i5-3210M, the P643’s result was merely average and both the Gigabyte U2442N and Samsung 550P5C-T02DE were about 2 percent faster again. The predecessor’s Core i5-2410M scored12 percent lower with 4595 points. We used the Futuremark’s PCMark 7 suite to evaluate overall system performance. Our Acer TravelMate P643 system scored 2050 points in this test, while the preceding TravelMate TimelineX 8473TG was about 14 percent slower. As was the case for the 6.9 Windows Experience Index, the Futuremark benchmark shows that the hard drive is the bottleneck for the system. The System Storage sub-score was a meager 1417 points and is easily surpassed by SSDs which score 4000 points and higher. The Lenovo ThinkPad L420 based on the Core i5-2520 was not faster, but the ThinkPad T530 2429-5XG with a 7200 RPM hard drive scored approximately 26 percent higher. 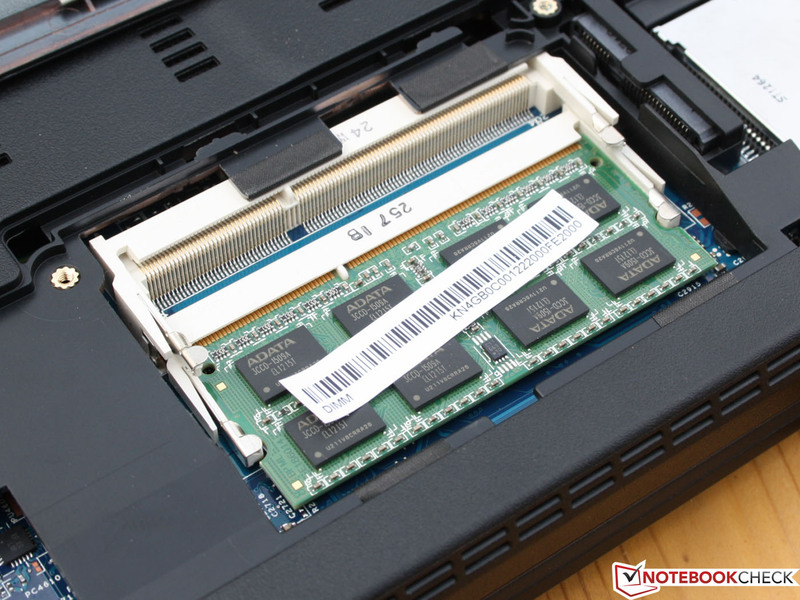 The Lenovo ThinkPad T420s 4174-PEG featuring the Intel SSD 320 performed significantly better with a score 218 percent higher in the System Storage sub-score and 62 percent higher overall. In the older PCMark Vantage, the P643 achieved a score of 6556, a mere 5 percent higher than the predecessor. The HDD score was also correspondingly low at 3499 points. SSD-based systems tend to score between 7300 and 57000 points in the same test, reflecting performance gains of 103 percent to 1536 percent. An example of such a system is the 14-inch Acer TravelMate TimelineX 8481TG which uses both a SanDisk 64 GB P4 SSD and a 320 GB conventional hard drive. As a disclaimer, the initially measured Windows Experience Index was 4.6 as it used the Intel HD Graphics 4000. Once we activated the GeForce card in the BIOS, we were able to record the higher 6.9 score. 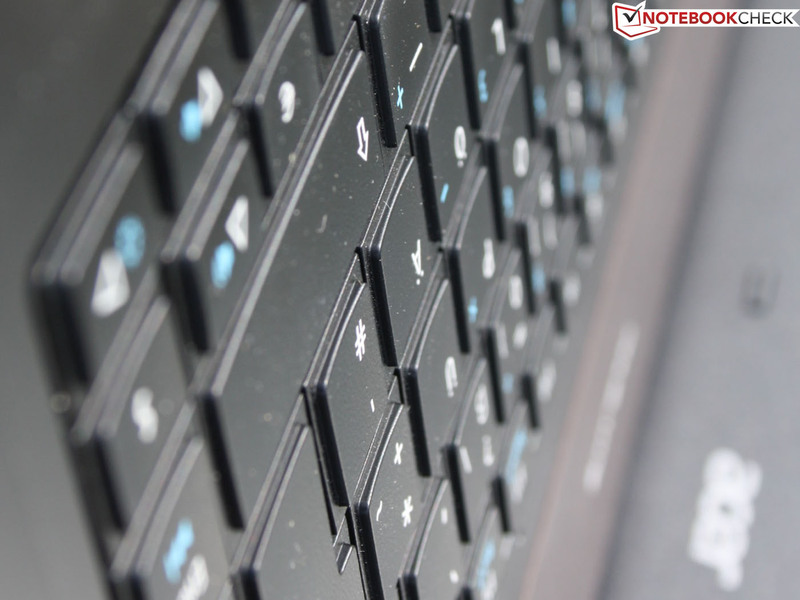 The TravelMate P643’s everyday performance is a bit sedate and applications tend to load slowly. In our measurements, the system required 51 seconds to boot and fully load. HD Tune and CrystalDiskMark showed slow read speeds of 73 and 70 MB/s respectively. Small, dispersed data requires the heads to be moved repeatedly and throughput in this scenario drops to 0.3 to 0.7 MB/s. Even the slowest SSDs, such as the SanDisk P4 SSD found in the TravelMate TimelineX 8481TG, achieve read speeds of 8 MB/s in this situation. The TravelMate P643 uses the Nvidia GeForce GT 640M as its dedicated graphics card. This implementation scored 10556 point in 3DMark06, a result that is typical of this graphics card. The predecessor’s GeForce GT 540M scored 22 percent lower. The Sandy Bridge-based ThinkPad T420 using only the integrated Intel HD Graphics 3000 achieved a score that was 70 percent lower. By comparison, the Ivy Bridge-based ThinkPad T530 using the Nvidia NVS 5400M was only 13 percent slower. The P643 rendered the Unigine Heaven test at an average rate of 22.6 fps. The older TravelMate TimelineX 8473TG was 36 percent slower. The GeForce GT 640M is capable of up to 25 fps in this test when paired with a quad-core processor as in the MSI CX70-i789BW7H. These benchmarks are more likely to be relevant to gaming performance. Special CAD and CAM software is likely to perform better with the stable drivers of the Nvidia NVS GPU. However, such professional software makes more sense on a workstation that is capable of higher resolutions and extended color spaces. Our TravelMate does not target this specific audience nor is it in the associated price bracket. Most users are likely to be happy with the consumer-based graphics card which is capable of handling business applications during the work day and fairly high gaming performance after work. We used both older and newer games to test the gaming capabilities of the TravelMate P643. We were able to play all titles at the native 1366x768 resolution at high settings without hesitation. These results are summarized in the following table. The GeForce GT 540M in the predecessor was capable of almost the same performance, although Risen was a bit slow at 30 fps. In our testing, we found that the noise level of the 14-inch TravelMate P643 was fairly well-controlled, although the continuously running fan was always audible. During idle and low load scenarios, the fan operated at its lowest setting and we measured a noise level of 32.4 dB(A). This could have been lower if Acer had implemented an adaptive fan speed control instead. During heavy and maximum load scenarios, such as during 3DMark06, gaming, and the CPU/GPU simultaneous stress test, the system noise increased to 43.5 dB(A). We found it interesting that there was no discernible difference between the noise emitted during the maximum load stress test and gaming. Compared to its predecessor, the noise levels of the TravelMate P643 have increased. Stress test CPU+GPU @2.9 GHz shows no throttling. As with noise, we found the temperatures to be reasonably restrained. While idle, the notebook was merely warm with a maximum temperature of 34 degrees Celsius (93 degrees Fahrenheit). 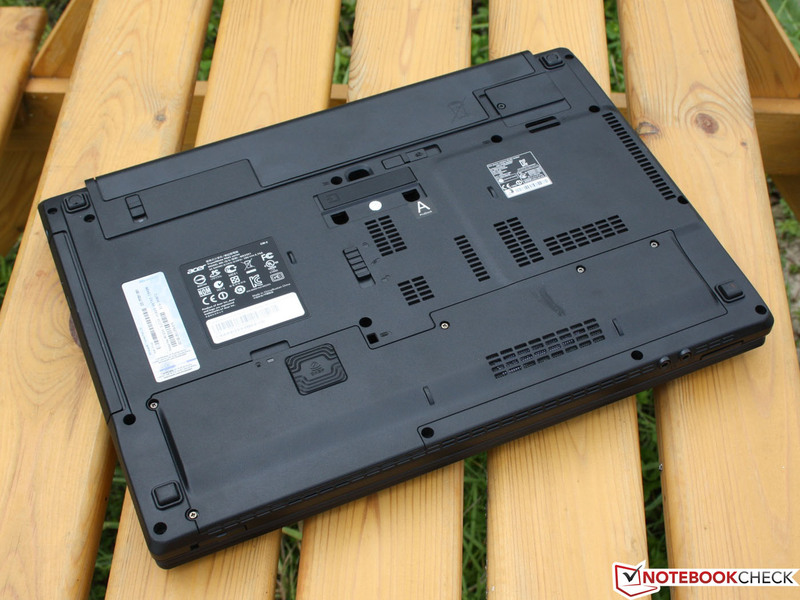 Under load, the temperatures of both the top and underside of the notebook increased rapidly. When the CPU and GPU were simultaneously and continuously subjected to an extremely high load, the temperature increased to the measured maximum of 48 degrees Celsius (118 degrees Fahrenheit) on some spots on the underside and directly under the primary heat vent. In this scenario, the wrist rest also reached a maximum temperature of 40 degrees Celsius (104 degrees Fahrenheit). While these temperatures may appear critical, they reflect a high continuous load and are unlikely to occur in practical use. After our stress test, we ran 3DMark06 again and recorded the same values as when the test was conducted immediately after a cold start. We also observed that the clock speed during the stress test was always above the nominal 2.5 GHz base clock. As a result, throttling is not an issue. (±) The average temperature for the upper side under maximal load is 37.7 °C / 100 F, compared to the average of 29.4 °C / 85 F for the devices in the class Office. (+) In idle usage, the average temperature for the upper side is 31.8 °C / 89 F, compared to the device average of 29.4 °C / 85 F.
(-) The average temperature of the palmrest area of similar devices was 28.2 °C / 82.8 F (-11.2 °C / -20.1 F). The TravelMate P643 uses an integrated mono speaker that we found to be acceptable for a business laptop but lacking in quality. The speaker produced no bass and low frequency tones were muddled. For those seeking better sound quality, we highly recommend using external speakers which can be connected via the headphone jack, HDMI, or Bluetooth as Acer did not even use stereo speakers. Our TravelMate P643 uses an Ivy Bridge processor which promises to provide increased performance while reducing power consumption. As with the preceding TravelMate TimelineX 8473TG, the P643 features Nvidia Optimus which can automatically switch between the integrated and dedicated graphics cards based on graphical demand. 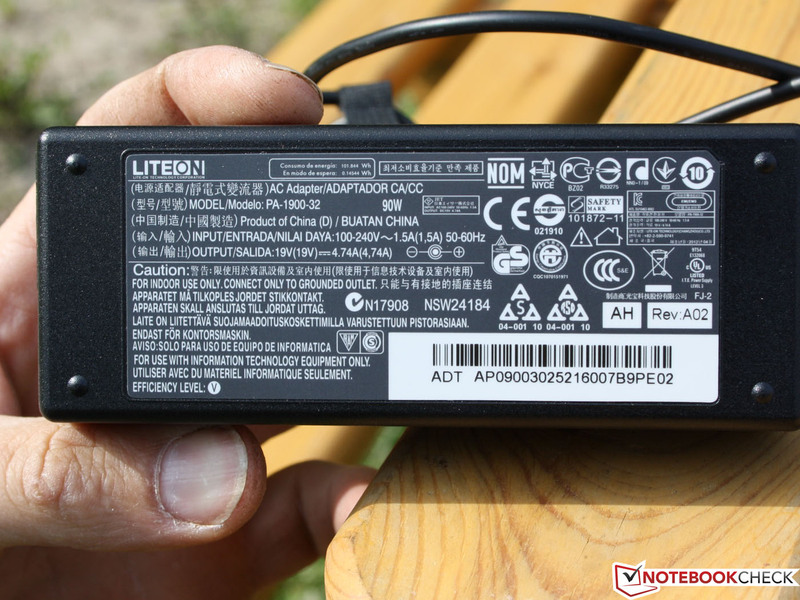 While idle, the GeForce card is disabled and we measured a maximum power consumption of 11 Watts, putting the P643 in the same league as some ultrabooks, such as the Toshiba Satellite Z930-119 which consumed 10.4 Watts. The lowest observed power consumption of 8 Watts was achieved by deactivating the Wi-Fi module and setting the display to the lowest setting. By comparison, the preceding 8473TG was a bit more conservative with a 7 Watt minimum consumption. Under load, the dedicated graphics card and Turbo Boost 2.0 increase power consumption. We measured a maximum consumption of 61 Watts. During gaming and while running 3DMark06, we measured a slightly lower 59 Watts. Compared to the predecessor, the P643 demonstrated merely a minimal increase in battery life. While idle, the measured runtime of 580 minutes is actually shorter than the preceding TravelMate TimelineX 8473TG’s runtime of 628 minutes. In the Wi-Fi test, the P643 managed to surpass the predecessor with a runtime of 365 minutes, up from 347 minutes. However, this difference is not significant enough to call the runtime an improvement. The following figures show the various runtimes and the charging time for the P643 as well as those of the predecessor. By comparison, the Lenovo ThinkPad T420i NW16NPB lasted a nearly identical 363 minutes during the Wi-Fi test. 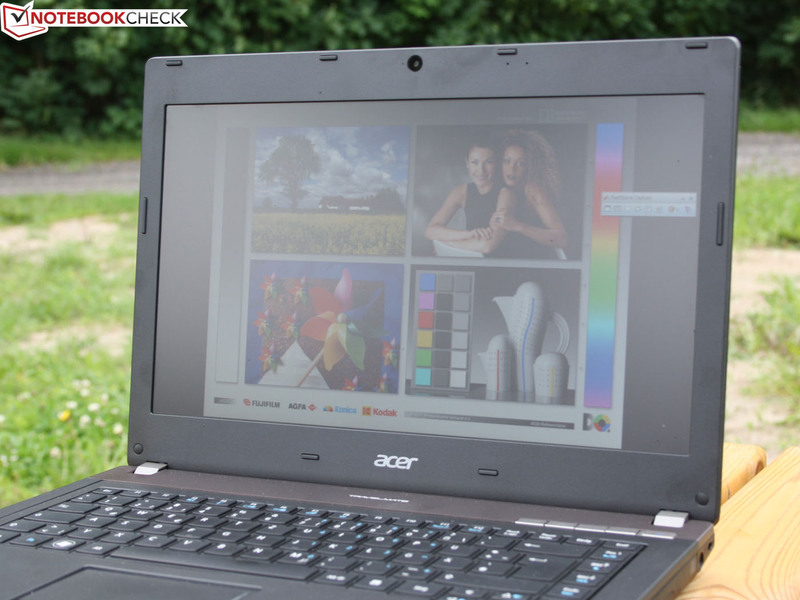 In the same test, the ThinkPad L530 managed a much better 430 minutes. The AMD-based HP ProBook 6465b kept up reasonably well with a 335-minute runtime. The 14-inch ProBook 4530s trailed behind all comparable models with a runtime of only 293 minutes. The good battery life is underpinned by the 66 Wh, 6000 mAh lithium polymer battery. Unfortunately, charging the battery takes a considerable period of time. 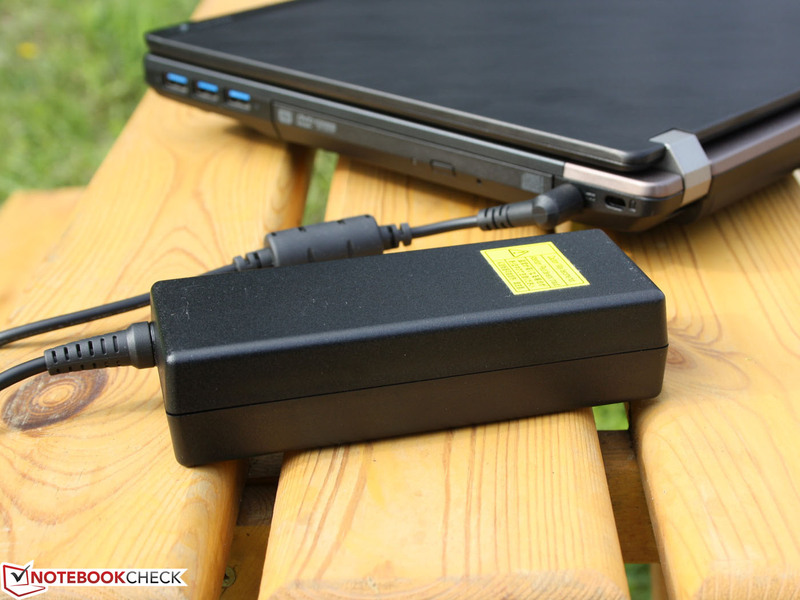 When the laptop is simultaneously used, the charging cycle requires 245 minutes to complete. 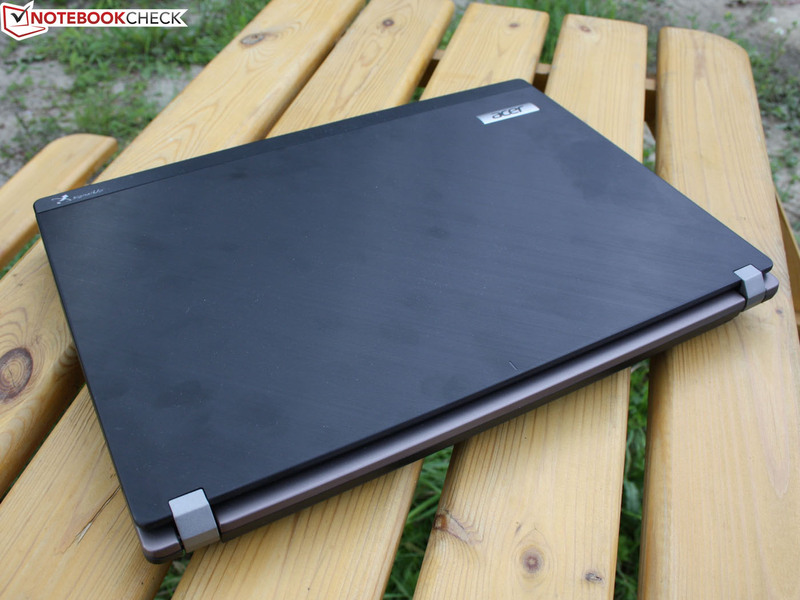 In the abstract of this review, we pondered whether this TravelMate P643 could compete with a Lenovo ThinkPad. This was not merely a rhetorical question. For a very affordable price, Acer has managed to create a low-cost ThinkPad alternative. While Lenovo offers countless configurations at higher prices with features such as HD+ display, SSD, and Core i7 processors, Acer only offers one standard configuration. Nonetheless, this configuration delivers a good product. The TravelMate P643 is capable of keeping up with basic L and T series ThinkPads in terms of performance. The GeForce GT 640M offers plenty of performance for both the home office and the casual gamer. For CAD and CAM software, the ThinkPad T530’s NVS 5400M would have been a better choice. 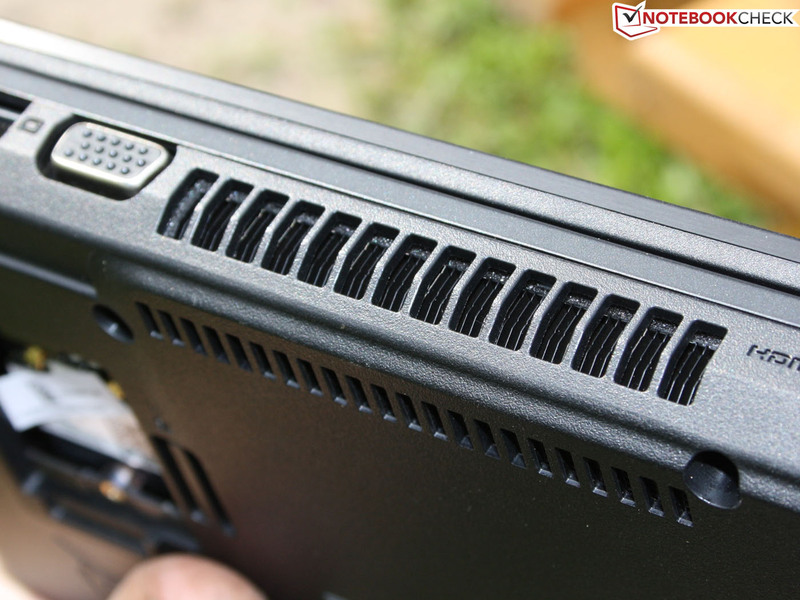 We found the build quality and sturdiness due to the magnesium case to be impressive. The fairly extensive security and administration software suite also seems useful for small business owners. 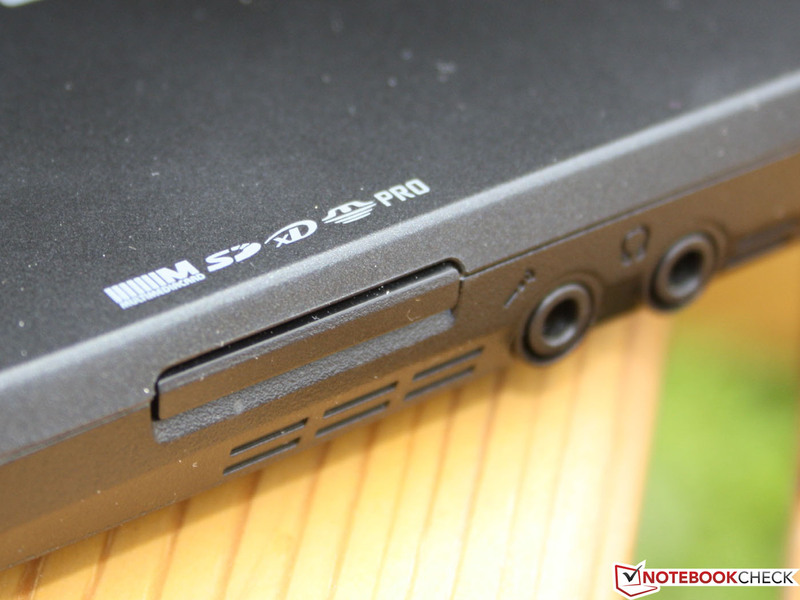 However, the Acer TravelMate P643 falls behind Lenovo in other areas, including input devices. If one can overlook the lack of a TrackPoint, the differences become more or less negligible. Lenovo also offers Mini DisplayPort and FireWire 400 where Acer does not. 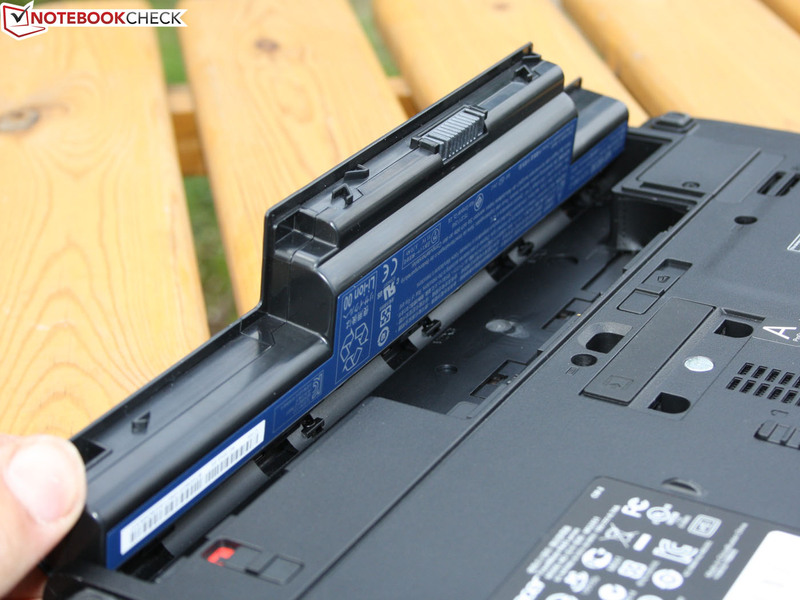 In terms of battery life, the ThinkPad T530 supports a superior 93 Wh battery. The basic T530 configuration, however, only uses a six-cell battery which levels the playing field. 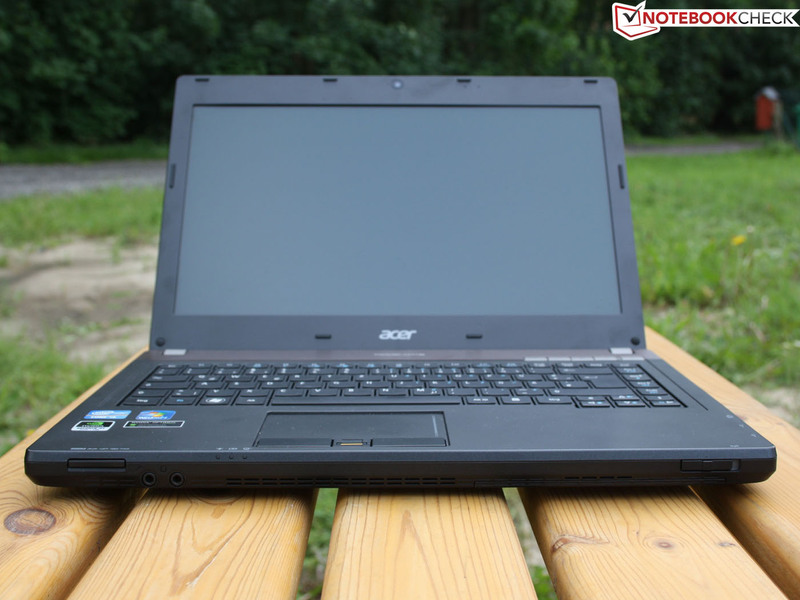 In summary, the Acer TravelMate P643-MG is able to compete with the less expensive ThinkPad L series in most areas and even surpass it in others, such as gaming performance. However, the ThinkPad T series is simply in a different league. While Lenovo executives and ThinkPad loyalists are unlikely to be pleased with our verdict, the simple fact is Acer created a business laptop that is able to compete with ThinkPads in the 800 Euro (~ $990) price range. Above that level, the ThinkPad line still reigns supreme. Acer apparently has business laptops. but also the docking port. The Acer ProDock retails for under 200 Euro (~ $245). The hard drive features anti-shock protection. but rather sits in a rubber bracket. The multi-bay optical drive can be removed. The keyboard features a drainage system. A dusty and clogged heat sink can be cleaned with compressed air. The Wi-Fi module under a separate cover. The RAM can be expanded using the additional slot. One 4 GB module is installed. is some room for a mini PCIe module. The power adapter is rated at 90 Watts. That is more than enough for the 14-inch laptop. Solid hinges and magnesium case. 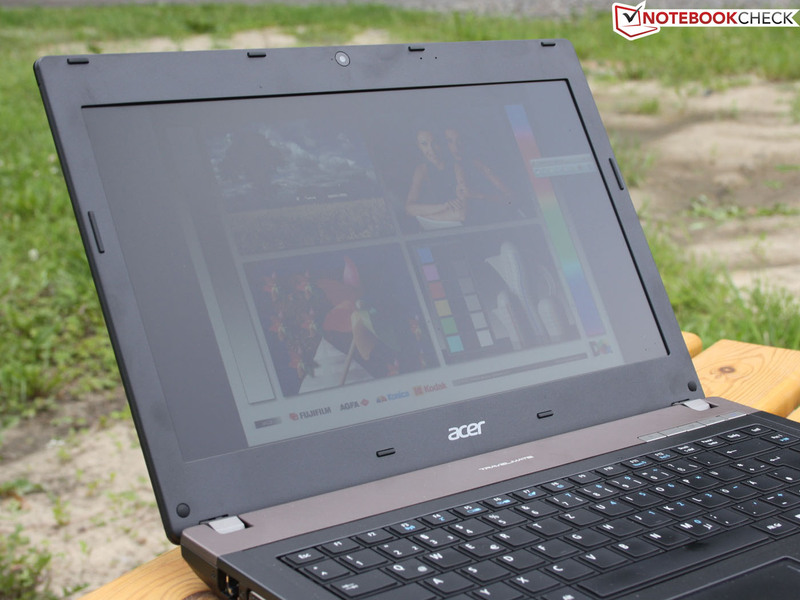 The Acer TravelMate P643-MG's rigidity is on par with ThinkPad models. The hardware wireless switch is a business standard. Take a look at the TravelMate series. Acer redesigned the series and found its way back to business basics. The 14-inch laptop has many positive features. The Ivy Bridge hardware is current. A good graphics card is installed. while the lid and wrist rest are made of brushed aluminum which catches fingerprints. Operation is easy, quiet, and efficient. eSATA is missing, but three USB 3.0 ports are included. The floating keyboard offers very good feedback. Rigid and solid magnesium case. Input devices offer good feedback. 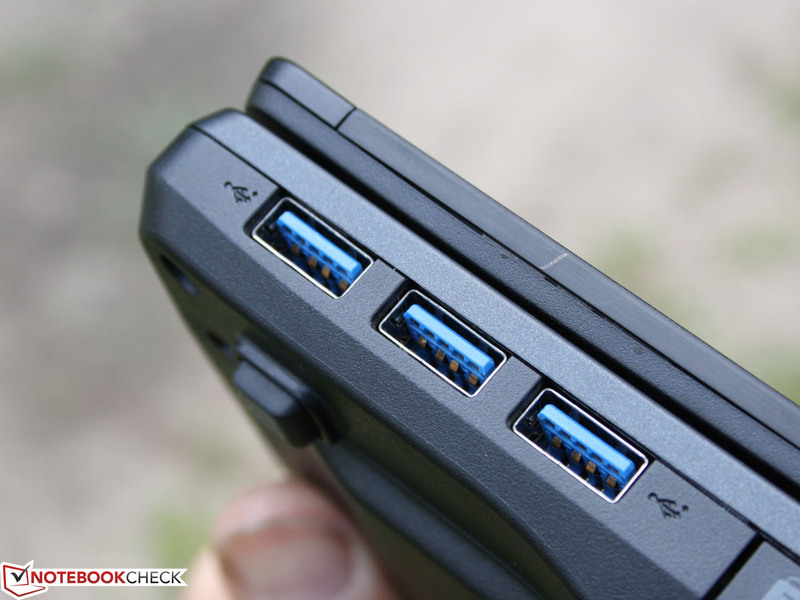 Docking port for Acer ProDock. Removable multi-bay drive. A higher resolution display would be better but Acer does not even offer one. 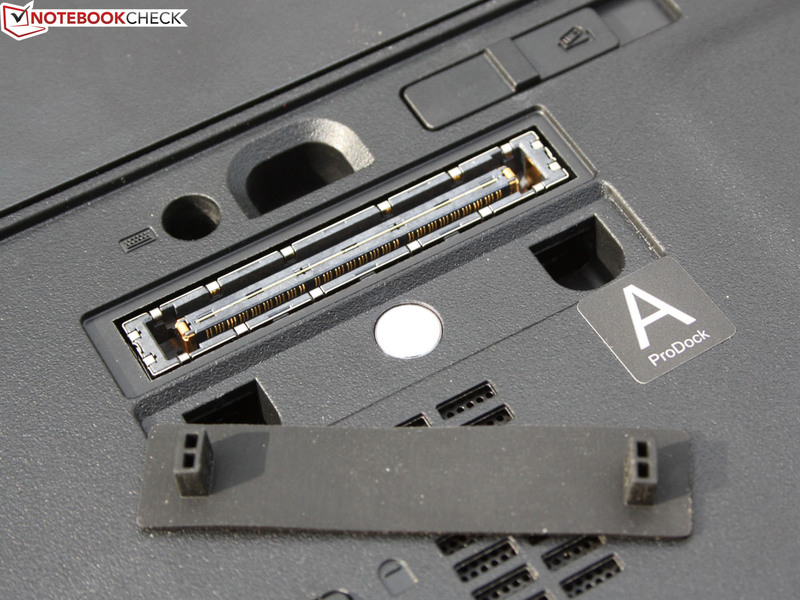 Acer gets rid of the eSATA port but installs a ExpressCard/34 slot.